The long-awaited Park Hyatt Bangkok was scheduled to open at one point in time in late 2014. The hotel actually opened its doors in May of 2017. After years of rumors that the property would or had been sold to another brand and deeper speculation it might never open at all, the Park Hyatt Bangkok welcomed its first guests on May 12th, with an official grand opening on May 18th, 2017. I was able to stay in this property with my family (while Matthew was elsewhere onsite) on May 20th. Personally, this hotel was highly anticipated as my family and I often come to Thailand for the holidays and as we prefer Hyatts generally. We were left with the Grand Hyatt Erawan as the sole choice in the Big Mango. While we have stayed in over a dozen properties in the city over the years, the Hyatt elite benefits for extended stays (free breakfast for all of us, access to the lounge with afternoon snacks and drinks, and the best use of confirmed suite upgrades) are excellent for family trips. But as I have covered before, Hyatt’s limited footprint gives guests few options in big markets, and in one like Bangkok (on par in population with Los Angeles) it’s even tougher to continue to choose their sole property (Grand Hyatt Erawan) when fierce competition rests outside their doors with a better product for less money. That all ended this week with the opening of the Park Hyatt Bangkok. It’s important to note that at the time of our stay, the Park Hyatt was the second most expensive hotel in the city behind only the Mandarin Oriental. When a five-star hotel chooses to charge more than twice the price of other five-star hotels in the area, hoteliers should expect greater levels of scrutiny. While my wife and I were exceedingly impressed with the property, at three times the price of the Le Meridien (another five-star hotel in Bangkok and our first true hotel love) – anything short of flawless is a disappointment. Our stay was not, unfortunately, flawless though a reasonable person might find my grievances petty. Matthew has provided some excellent images for the aspects of the property in common areas (entrance, reception, etc.) so rather than include my own which mirror his, I would rather submit that his sufficiently cover the stunning property. Its location is in the new Central Embassy mall, a very high-end shopping center with brands like Hermés, Gucci, and Prada attracting well-heeled diplomats from the mall’s Wireless Road address – the Embassy quarter. Here is the location via Google Maps. The ninth floor is home to both the pool and a pair of restaurants, the Embassy Room and The Living Room. Unfortunately, exiting the elevators from the hotel room can be a little awkward. The bank of lifts will dump guests into a birchwood-U with a single exit. Through that exit you have three choices, left (Living Room restaurant dining room with tables all around), right (more Living Room restaurant dining with tables all around), or straight ahead which leads to an outside area that appears restricted. While it turns out that this is a completely normal way to come into the pool area, there is not a single sign indicating where to go or how to get there. Further, the pool entrance options are not obvious. My family, like many others, trudged awkwardly through the dining room to the clearer entrance to the pool area with floaties-in-hand, and sunglasses donned. Some Japanese guests came through the dining room in their robes (with swimsuit underneath) as wearing robes to and from the pool is their custom – none of us wanted to walk through the dining room like that. Walking through the Living Room to get to the pool. Once we made it outside, we found paradise. Beautiful palm trees and luscious green spaces gave the exposed building cutout a resort feel despite the nearby skyscrapers and busy streets below. Big umbrellas and long, comfortable deck chairs lined the edge of the pool. There were rows of loungers and umbrellas, tiered and stepped to the side of the pool that offered better coverage from the sun. This allowed those who wanted to be outside and near the water, but not scorched by the Bangkok sun to enjoy a day outside. The infinity pool is a gem in a city of amazing pools. There are a few reasons that this particular pool is so perfect for the Thai capital. First, the pool gets lots of direct sunlight because other high rise buildings are out of the trajectory of the sun (unlike pools at the Grand Hyatt Erawan and the Conrad which are surrounded by other massive buildings blocking direct sunlight). It is also a heated pool which – yes this sounds crazy, but no it’s not crazy – helps to make it more comfortable. Without the direct sunlight, many other pools that are not heated, are downright cold. One of the aforementioned properties had a virtually un-swimmable pool with temperatures purportedly (and believably) in the 50Fs. Cold pools are common in Bangkok but thankfully, the Park Hyatt has put any concerns of hypothermia while swimming to bed. At the edge of the infinity pool, guests can look down to see the Embassy of the United Kingdom and Switzerland among others. The shimmering building, Central Embassy, radiates that glorious sun on to the faces of swimmers as they bask in the heated pool. The area appeared to be devoid of a hot tub, but really, who needs one? There were some shallow areas for those who just wanted to dip their toes in the water, or for children to wade in. Some guests tried to complete laps in the pool but this was quite forced and they didn’t keep at it for long as it’s really not conducive to such. During our short stay we spent a lot of time at the pool and loved it. The view never became routine, and the service was excellent. The pool was stunning though limited for a property with 220 rooms when completed. The hotel was nearly sold out for our one-night stay, however, with only 40 rooms ready-to-rent and the pool chairs all claimed during our first afternoon swimming, I can only imagine the terror that will take place when the hotel is even half occupied and triple the people are competing for the same amount of space on the deck. Traveling as a family, we were also quite glad to see that while there was not a “kids pool” and an “adult pool” there were areas designed for aesthetics that also served as a very shallow area where children were able to get in the water without being in the 4.2ft deep water. My daughter Lucy, finding herself on top of the world as usual. We were able to take advantage of the pool menu that we found completely reasonable for a top flight property in Bangkok. Simple Thai entrees were priced at just above $10, Mango Sticky Rice, $7. Wagyu beef burgers, and club sandwiches stretched the budget a little more (near $16) but all of that is inline with other established five-star properties in Bangkok like the Conrad, and Le Meridién. Poolside food and beverage was a virtual bargain when compared to middle of the road properties throughout the Caribbean. Every hotel guest at the pool is welcomed with a fruit infused iced tea and a very cold bottle of water. This is followed by a cold, wet towel and drying towels for when you get out of the pool. Lunch poolside was affordable and delicious. The iPhone 7+ does some nice backend photo work automatically so that I can concentrate on eating and not editing. Park Hyatt Bangkok’s custom fruit infused tea, frosty plastic water bottles, and cold face towels await. Due to my Globalist status I was upgraded at the property from a Park King to a Park King Suite. If I was to return, I would likely use an upgrade to secure the suite in advance. We had a chance to see a standard room, and it was fine, but didn’t compare to the suite we had. As the door opens to the suite from the hallway, lights turn on and the shades draw back revealing metal and glass buildings and the diplomatic quarter below. To the left is a guest half bathroom and to the right a walk-in closet. There were some oddities in construction of the property and the location of our closet was just such an architectural curiosity. The closet, a Park Hyatt standard walk-in with sufficient storage for a small family for a couple of weeks was the farthest possible point from both the master bathroom and the bedroom. How useful is a closet outside of your room? One evening, we had guests who were waiting for us to get ready after coming back from pool. We were walking back and forth to the closet in robes from the bedroom and I cannot understand how a newly-built hotel would have designed this flaw. I’m not an architect, but I am a frequent hotel guest and this (despite the rest of the amazing aspects of the property’s design) was an unnecessary and inexplicably shortsighted design element. Tucked away in the corner of the living room is a well-appointed minibar with space for bottles of water, and liquors. There was a small collection of moveable tables and a generously sized couch. A 50” slim line TV was mounted in front of the windows and featured a number of ways to connect, all of which looked easy, none of which actually were. We attempted to use the Bluetooth to access the speakers throughout the suite built into the ceiling but couldn’t make that work either, despite my own technical prowess and that of a pair of Millenials doing their best. One of the best parts of this room was the long table extending from the wall towards the middle of the room. There was room for at least six but possibly as many as seven or eight if you decided to host a dinner or private meeting. The table featured the Bluetooth connection that we couldn’t get to function, an HDMI connection to display your content through the speakers and on the TVs, and some USB chargers that were handy and kept our devices powered up. To the right and left of the King bed were nightstand tables with good access to full power, control of the lights throughout the suite and control of the blinds on the windows. The pillows were perfect for me, and there were a variety of options if you wanted a foam or hypoallergenic replacement. Opposite the bed was a TV identical to the living room, and in our case, a rollaway was placed for our three-year old daughter. Even jumping on her rollaway to make sure it was solid. We hadn’t requested the rollaway but had listed the correct number of guests on the reservation that asks for the child’s age. Most hotels just want this information to ensure occupancy concerns are avoided before guests arrive, but in the case of the Park Hyatt Bangkok, this was used to prepare a place for our daughter complete with a bath mat and slippers placed at the foot of her bed. They also provided a large coloring map of the city of Bangkok, as well as toiletries for children like tear-free shampoo. Lucy’s slippers courtesy of the Park Hyatt Bangkok, waiting at the foot of her bed. Large foldout coloring map of Bangkok for our three-year old. We really appreciate the extra thought and care that goes into making the suite our home away from home, especially when we don’t have to communicate these items as a request. The bathroom was a real highlight of the suite. Twin vanities were spread out more than six feet from end to end with the closed-door toilet to the farthest end of the room, and the bath and shower at the opposite end. The bath was a two-person soaking tub with an ornate wall design and lighting that made it feel more like a spa than a bathroom. Another wall held a small TV, adequate for the tub, and a small table that contained soaps and shampoos. There was a rain showerhead in an undefined shower area next to the tub as well as a directional hand sprayer. One downfall of the setup was that you could use either the rain showerhead or the sprayer but not both. For bathing our daughter and washing her long hair, this involved a little creativity, enlisting the sprayer from the tub while maintaining the rain shower head. The shower featured a shelf cutout for shampoos and soaps, Le Labo was the provider and they never let me down. Le Labo, premium shampoos and soaps – I shamelessly took as many as I could. I am about to lose some readers with this next item. Neither the guest toilet, nor the master toilet featured a Japanese adaption. That is to say, there was no seat warmer, bidet, air dryer attachment which – yes I understand how first world this problem is – comes standard at other area properties for a fraction of the ADR (average daily rate). You’d think that being three years late with construction, no stones would be left unturned; this one was and I can say with certainty that I was not the only guest who was surprised and disappointed to find a Japanese toilet missing. A gizmo-free toilet in a five star hotel in Bangkok? Sacrilegious! As outlined in the opening of this post, one of my favorite benefits of World of Hyatt Globalist status is free breakfast for two adults and two children every day of your stay. Breakfast at Park Hyatt properties tend to outshine all others, even other top tier hotel brands. Walking into the restaurant we were offered a table and coffee while another attendant poured juice. Cold buffet tables, charcuterie, pastries, and fruit filled the room and our plates. The highlight of my breakfast and perhaps even my day, were the many cold pressed juices they offered in both pitchers and bottles. Sitting down at the table, I was looking for something more substantial and for our daughter to have something tailored more to her taste than salmon, crème fraiche and capers. A menu was placed in front of us but there was a problem. Only four items were listed (I count an omelet and an egg white omelet as the same dish) and none of them were kid friendly. Outside of the eggs benedict, none of them were “me-friendly” either. I followed my wife’s lead and ordered the eggs benedict as she did, but without considering the limited menu before me I also order pancakes for my daughter. Sure enough, all the food came out as expected despite pancakes not being on the menu. I do expect the kitchen to deliver whatever we order with perfection from a top tier hotel, but what I don’t expect is the existence of two different breakfast menus. Eggs and an egg white omelet are not two distinct choices. 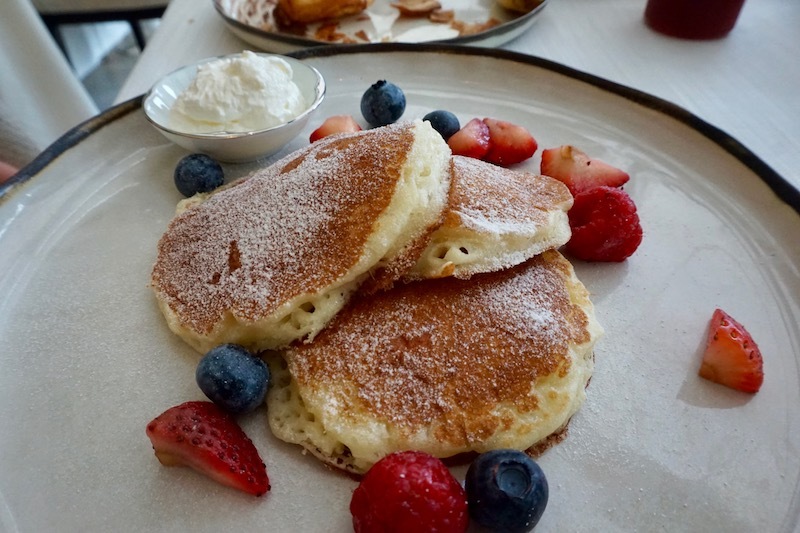 Fine china and genuine silver are to be expected at the Park Hyatt Bangkok, but pancakes on the menu should be too. Ordering off an absentee menu which included pancakes, french toast and waffles. Busy in the kitchen, wood-fired grill roaring to life for the day. Simple, delicious and elegant – one of your four approved choices. It appears that when the hostess asks for your room number, she is first checking to see if you are Globalist (i.e. getting the breakfast for free) and then distributing a limited menu as opposed to a full menu. This is a pointless and offensive approach to the breakfast amenity for what should be considered the chain’s best clients. It’s pointless because a guest like myself will still order whatever they like and not pay for it whether it is on the paper menu presented or not. It’s offensive because they are intentionally shortchanging and misleading guests that this is the entire selection. Had I not chosen to order at random, I would have not known that instead of a handful of entrée options, there were more than a dozen to choose from. Park Hyatt Bangkok – this is simply beneath you. The property is one of the most beautiful in the city, it’s one of the most expensive as well, do you really need to save a couple of dollars on breakfast for a small contingency of guests? And aren’t pancakes (just flour and sugar) cheaper than salmon Eggs Benedict? Yes, we will certainly stay at the property again, but not every time we come to Bangkok and we typically visit once or twice per year for 5-10 days at a time. The hotel is constructed to a high standard and designed well in places, but there just seems to be some missing parts. The pool is a standout hit, but I can only imagine how disappointed we will be when we return and the hotel is fully open (currently only 20% of rooms are available) and there is simply no space to comfortably enjoy swimming or sun tanning. Issues with dual breakfast menus and lack of signage are easily corrected and I think, in time, they will get these aspects right. Design flaws like the closets being nowhere near the bedroom are problems that simply can’t be resolved. Ultimately, it will also come down to price. The Grand Hyatt Erawan has long been more expensive than other properties in a similar condition but got away with charging more because of their loyal Hyatt members who had no other options in the city. I will cover more about what I think will happen to pricing for the both Hyatts in Bangkok, but for the Park Hyatt Bangkok in particular, costs will need to drop if they intend on filling 220 rooms – they had already been slashed from initial market open by 20%. I think that this Park Hyatt is capable of delivering some of the best experiences of any hotel in the city, and granted, opening week is challenging for any business. However, opening three years after the initial announced date with just a fraction of those rooms at one of the highest rates in the city – demands a better experience. Until they fine tune their operation and sync their pricing with their soft product, I will probably be at the Sofitel down the road. How would you compare it to the St Regis? Thats what i would think is the major competition. @Joel, thanks for reading. I had a chance to visit the St. Regis as a friend was in town and of course the Park is brand new so my first thought is that it’s updated and fresh. However, for 40% more I don’t think the Park would be worth the extra expense given a choice between the two. I don’t stay at new properties till folks like you have sorted them out, probably 3-4 months later. I would never check into a 2 day old hotel it I could help it unless it was an all expense paid stay as a quest of the hotel. @Eric, I don’t know that I’m “sorting them out” but I would agree that there will always be growing pains with new hotel opens. If you hear of hotels giving away free rooms – please let me know, I’ll be signing up right along with you. In some markets, $270-300/nt is a mid-range hotel (New York City, Chicago, Hong Kong) but in Bangkok it felt somewhere between highway robbery and sinning because you can get such good value for far less money. That being said, I’ll probably be back soon once prices level out. Wow! You’re lucky you get to go to BKK every year! Do you live in SE Asia? I was at the GH a few months ago, and I loved it! Do you have a photo of the regular menu? How did you find out you were given a limited menu? Did you ask? That is really odd, and I’d be offended as well. Was sunblock/bug spray provided by the pool? Hi Angie, I have a picture of the real menu if Kyle doesn’t. I’ll be posting my own review tomorrow Wednesday that will include it. @Angie – I don’t have a photo, I will lean on Matthew for that. I found out about the second menu after I just decided to order my daughter pancakes without knowing if that was something they offered (and they did) and then seeing a table sit next to us with a menu significantly larger and more comprehensive than my own. The irony is of course that they ordered an item off the limited menu anyway. The property did offer sun block and bug spray at the pool at a towel stand, though the towels were brought to us so had I not looked around or known they sometimes offer this, I might not have known. We lived in Thailand for awhile so we return as often as we can, we rarely buy tickets to Thailand and rather burn miles to get there for free (plus taxes). We also try to find business class paid fares to other Asian destinations and tag on shorter awards to get us where we want to go. Last year we used $1400 business class fares to get to Beijing, earned miles through the process and burned hotel points to stay and eat (breakfast and evening snacks) for free. It seems like a lot of money to spend (and it is) but side-by-side with caribbean properties when hotels and flights are factored in, it really isn’t that far out of line with what most families spend on vacations every year. This was interesting to read. After four visits to BK and another in October, Le Meridien is what I think of as my home-away-from-home there. It’s not the “fanciest” by any means, though it is always very comfortable – but it’s the service that keeps me coming back. Not only is it excellent, it is delivered effortlessly, which is something I’ve seen other hotel staffs struggle with. When my traveling companion and I arrived there last month, we were welcomed back by several of the staff as soon as we walked through the front door, despite it being six months since our last stay. I’d actually been thinking about staying a few nights in October at the Park Hyatt, given how enamored I am of the hotel’s design – but I think perhaps I’ll settle for stopping in for a drink. The huge difference in price vs LM is hard to justify. And also agree 100% about the missing Toto Washlets – definitely a FWP, but it’s one of the most important features of a room for me. Frankly, the nicer the property, the more glaring the omission of what should be a standard feature. @EJC – Le Meridien Bangkok will always be our first love. I agree that the service is effortless and the cost (typically $99-120/night) makes it one of the best values in the city for our money. It’s the comparison to that property (among others) that makes the price so hard to justify. Granted, the Park is simply nicer, better located and impressive, but it’s not worth three 2-3 times the price. I will cover soon how I think rates will adjust for the property in the future (along with the Grand Hyatt Erawan) but when they do ease a little bit or open up some more award availability, it’s worth your stay. And if you have some of the free night certificates built up and can combine those with award nights and a suite upgrade, I think you’ll be very happy with your stay. On the Toto Washlets… I have looked at getting one installed at home. Maybe this would take away from the luxury of finding them when I stay abroad or perhaps it may ruin me for all the hotels that do not have them. I haven’t pulled the trigger yet, but it’s been carted in my Amazon account before. The place looks nice, but – $270-300 a night? That’s just plain heinous. I’m also skeptical that you’ll see any meaningful rate reductions, given that a) you reported the hotel was full, even at those rates, and b) you Hyattists seem to be a crazy loyal bunch. Very curious to read about your thoughts on future pricing, though. @Meanmeosh – Good to hear from you sir! I agree that for the market is insanely high priced and that’s what causes such high scrutiny, if you charge for perfection you have to deliver perfection. I agree, Hyatt loyalists are a crazy bunch and I am among them (though I hold top tier status with IHG and Hilton and have already prequalified both programs). But I also received a suite due to my status which has to be calculated against the rate for suites, and included breakfast also adds to that value. Had I added a breakfast package and booked a suite in the Sofitel, Le Meridien, or Conrad Bangkok, I would have paid roughly the same money for what was delivered. That being said, it will have to get cheaper for them to earn my continued business and I suspect, the same for Hyatt leisure travelers. OK, no Japanese toilet, but was there at least a “bum gun”? If not, that’s a deal breaker for me. I can’t go back to using just toilet paper. @Gavin – Not sure that I am familiar with a “bum gun”, but I assume that you’re referring to just a bidet function but not the whole Toto seat apparatus (heating, drying, night lights, multiple streams, phone charger – kidding on the phone charger). I am disappointed to report that the toilet was entirely basic in nature – no bidet of any kind. The only way it could be more basic is if it was a hole-in-the-floor, squatty potty. Look at “bum gun” photos in google images. Muslims call it a “shattaf.” Very common in Southeast Asia. I installed one in my house in Las Vegas. I once emailed a new hotel in Phnom Penh to ask if they had bum guns before I made a reservation. They responded back to say that because they were a “high end” hotel they had toilet paper only. It’s madness. It’s crazy. We should all write to the general manager or mention it on TripAdvisor or something. Do they have kids club at the hotel ? They do not, though they treated our three year old Lucy like a princess.